RP7430SS is rated 3.0 out of 5 by 2. Rated 1 out of 5 by Disgruntled from Waste of Money! This is the worst designed tub strainer - do not buy! I purchased three of these strainers to match my new Dryden fixtures. The design of this product does not allow for all of the water to drain out of the tub. The dome and the drain holes are above the water level. I literally have to wipe out the water around the strainer, wringing out the cloth several times. I am now forced to purchase new toe tap drains and matching overflow plates, at a very large cost. Delta needs to rectify this design problem. Rated 5 out of 5 by JIFH from Everything Matches I splurged and purchased this matching tub drain. So glad I did. What is the size of shower drain cover RP7430RB in Venetian bronze? Is this a 4&quot; drain? I need this color but was hoping to get a design with the two screws on the outer part of the drain not in the center.. is this available this way? I have a monitor shower/tub with a drain stopper. I am looking for the strainer that will screw into the same spot as the stopper. What is the diameter of the strainer? Will this strainer fit all Delta shower/tub drains? Thanks! Do the finishes which show a notched edge in their image come with notched edges? I need a strainer with a notched edge and have been unable to find one. Which finish is irrelevant I am wondering if any of the strainers come with notched edges. Delta rp7430 chrome. The photo shows a notched rim, which is what I want. 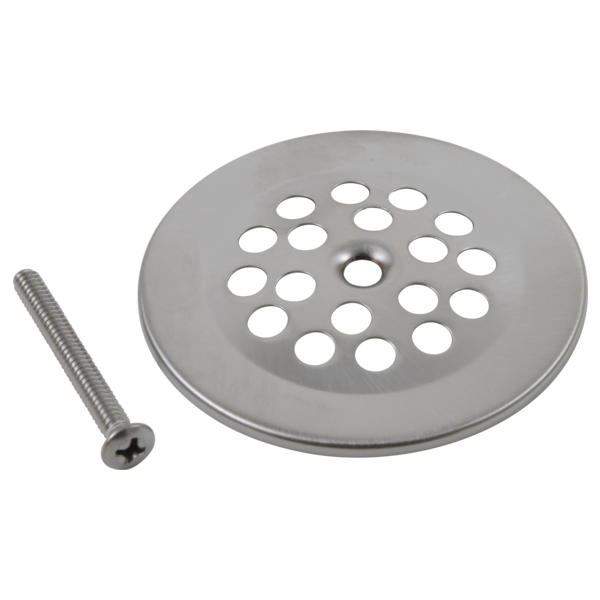 i am looking for this Dome Strainer replacement but with a 5/16&quot; x 18 screw. Is that available in oiled bronze? Thank you for your question. Delta Faucet model # RP7430RB is the only dome strainer we make in the Venetian Bronze finish.